This small bird has dark bluish upperparts, a greyish white belly, and contrasting orange face and neck. In flight, the wings are quite sharp, the v-shape in the tail feathers is often obvious, and the dirty white belly and contrasting rusty neck can often be seen. 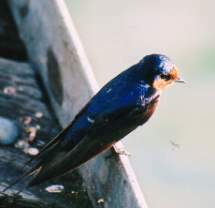 They are often seen flying fast over and around water, sometimes in mixed flocks with other swallows and martins, and thus identification can be difficult; however, 'welcome swallows' lack the white rumps of the martins. Welcome Swallows can regularly be seen perched on wires. While in flight they may emit a single high 'chip' as they swoop past. They often nest in buildings, under bridges, and even on boats and river ferries. They are found above more open habitat over much of eastern, southern and parts of central Australia, including urban areas and agricultural situations. They are partly migratory, with many migrating from south-eastern Australia, along the east coast into the tropics at colder times of the year. Their small nest is a cup made from mud and grass, lined with softer materials such as fur and feathers, and is often attached under overhangs in caves and human-made structures.